Catherine is a recognised leader in Dietetics and has international standing as a leader in Mediterranean diet research. 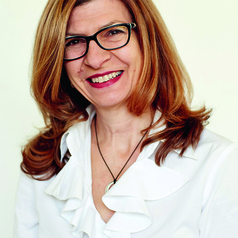 She is the Head of School of Allied Health at La Trobe University, an Accredited Practising Dietitian, deputy chair of the Australian Dietetics Council, and is the founding head of the department of Dietetics and Human Nutrition at La Trobe University. Recent positions Catherine has held include Associate Dean International Faculty of Health Sciences, La Trobe University, Accreditation, Recognition and Education Services Manager with the Dietitians Association of Australia and Fellow of the Centre of Clinical Research Excellence in Clinical Science in Diabetes at the University of Melbourne. Catherine is a well known expert on the Meditedrranean diet and has been successful in collaboratively raising in excess of $1.9 M research funding over her career to examine the health benefits of the Mediterranean diet. Catherine is the principal investigator of the Australian-Mediterranean Islands study which is investigating the healthy profile of elderly Southern European migrants in Australia. Catherine has authored over 50 peer-reviewed publications with 756 citations (>590 in last 5 years), have an h-index of 14 (Google Scholar) including 15 papers in the last 5 years with at least 10 citations (i10-index of 15).Catherine has also authored an RACGP HANDII Guideline on Mediterranean Diet in CHD management (May 2014), 3 book chapters, co-edited a Nutrition textbook, and has published 2 Mediterranean Diet Cookbooks (The Mediterranean Diet 2013, The Mediterranean Diet Cookbook 2015). She is currently supervising 10 PhD students; 5 in Mediterranean diet studies. Can the Mediterranean Diet Prevent Prostate Cancer? , Molecular Nutrition and Food Research. 2009, 53:227-239.